The fun over at Lost Coast Portal to Creativity doesn't end with today's finale of 31 Days of Halloween as we roll straight on into our Day of the Dead Celebrations! 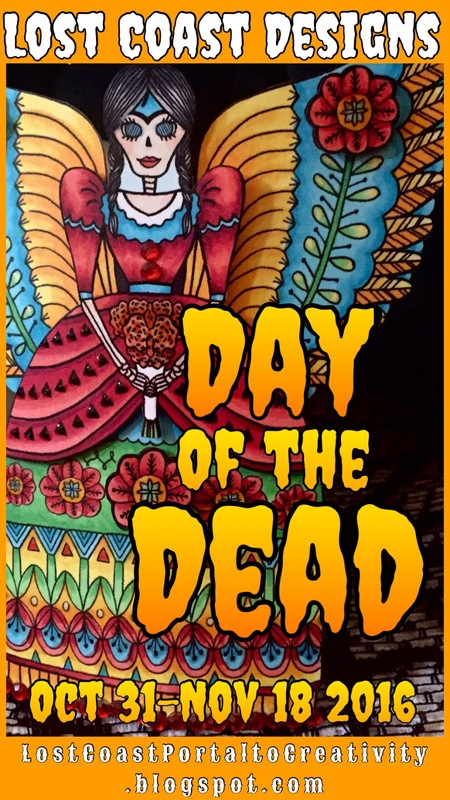 Starting today through to November 2nd we will have daily offerings for the traditional 3 days of Dia de Muertos followed up with reminder posts during the rest of November too! Everyone is invited to come and join the fun and enter rubber stamped projects in the linky party on today's post HERE! My DOTD project today features a new addition to the Lost Coast Designs stamp line, a gorgeous Day of the Dead Angel and she's available in two sizes, 5 inches and ATC size. 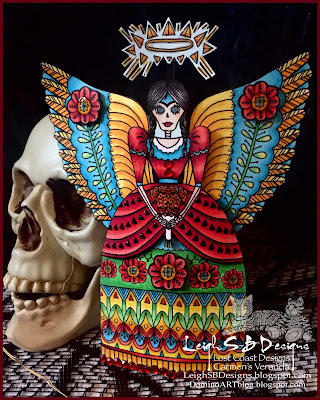 I used the 5 inch version and made a 3D Angel for my black Halloween tree. I stamped her onto Neenah solar white cardstock twice in Onxy Black Memento ink and fussy cut out one entire image and then just the flowers from the wings, the largest flower on her skirt, her skirt bustle, upper body and her halo from the 2nd. I coloured everything with Copics and embellished her gown with red jewels. For extra dimension and sparkle I added touches of Viva Pearl magic transparent white dimensional paint to the entire image. To make the tree topper I cut a piece of acetate and formed a cone. 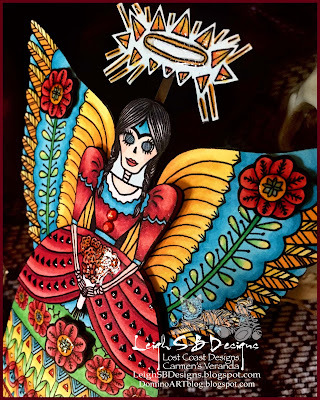 I then curved the main angel to fit the curve of the cone and adhered it in place with double sided sticky tape and adhered the fussy cut layers to the main image with pop dots. The finishing touch is her halo which is attached to a thin strip of acetate so it floats above her head. Thanks for stopping by to see my project! 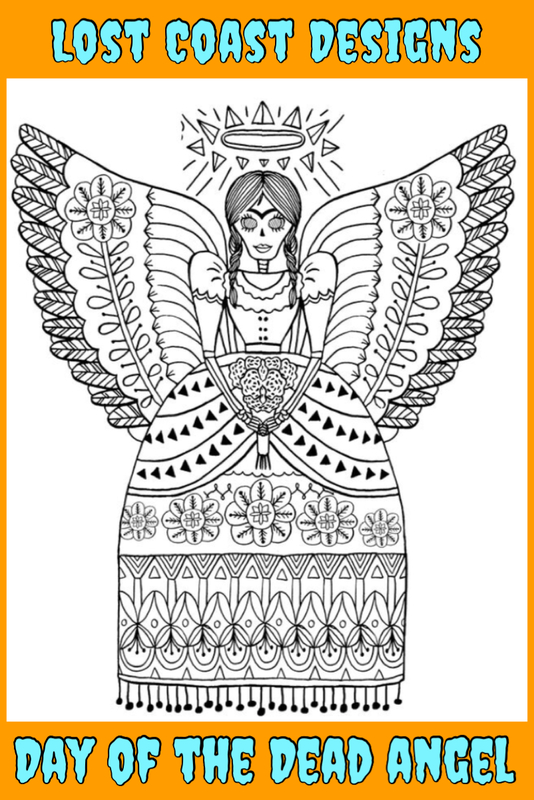 I hope you'll come and join me over at Lost Coast Portal to Creativity with the fun never ends! Oh yes...loving this. I love LCD stamps, but their site is a pain to order from. 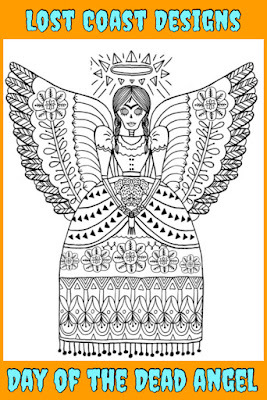 After seeing what you made with the DOTD Angel stamp, I want to order one, but dread wrestling with their website! I guess pleasure and pain do go hand in hand sometimes.